Patients with psychiatric disorders have high cigarette smoking-related morbidity and mortality. Varenicline, a α4β2 nicotinic acetylcholine receptor (nAChR) partial agonist, has been approved for smoking cessation, but few studies compared the efficacy between the smokers with and without different psychiatric disorders. Smokers aged more than 20 years with a daily cigarette consumption of more than 10 cigarettes/ or a Fagerstrom Test for Nicotine Dependence Scale (FTND) score of more than 4 were enrolled. The efficacy of smoking cessation and adverse effects were compared between the smokers with and without psychiatric disorders after 12-week varenicline treatment. In total, 140 smokers were recruited, of whom 94 (67.1%) had psychiatric disorders, including schizophrenia (n=19), bipolar disorder (n= 29), depressive disorder (n=31), or other psychiatric disorders (n =15). Compared with the smokers without psychiatric disorders, those with psychiatric disorders were significantly more likely to be women, younger, have a shorter smoking history and a higher FTND score (all p<0.05). After 3 months of varenicline treatment, the smokers with psychiatric disorders had a significantly lower point smoking cessation rate (12.4% vs. 27.3%, p=0.012) and a lower percentage of daily reduced cigarette consumption (54% vs. 68%, p=0.02). The most commonly reported adverse events were nausea, without any group difference. The smokers with psychiatric disorders had a lower point smoking cessation rate than the smokers without psychiatric disorder after 12-week varenicline treatment. The development of novel tobacco treatments program integrated with psychiatric management for these patients is required. Patients with psychiatric disorders have high cigarette smoking- and tobacco-related morbidity and mortality [1-3]. Previous studies have reported that 70%-90% of patients with schizophrenia, 54% of patients with bipolar disorder, and 40%-50% of patients with depressive or anxiety disorders are smokers [4-6]. The prevalence of cigarette smoking is 2-3 times higher in patients with psychiatric disorders than those in the general population [1,7]. The standardized mortality ratios for all tobacco-linked diseases combined are 2.45 for patients with schizophrenia, 1.57 for patients with bipolar disorder, and 1.95 for patients with depression . Tobacco-related conditions constitute about 53% of total deaths in patients with schizophrenia, 48% in those with bipolar disorder, and 50% in those with depression . Addressing tobacco use in psychiatric populations is a critical clinical and public health concern. The mechanisms linking psychiatric disorders and cigarette smoking are complex, involving biopsychosocial mechanisms, and likely differ across disorders. The previous commonly held view is that patients with psychiatric disorders experience more functional loss in their interpersonal relationships and tend to lose the ability to have leisure or pleasure-seeking activities, leading to the use of cigarettes in an attempt to relieve their stress [1,4-10]. But recent evidence suggests that quitting smoking may actually improve mental health symptoms [10-12]. Varenicline, a partial agonist of the α4β2 nicotinic acetylcholine (nAChR) receptor and a full agonist of the α7nAChR, has been approved for smoking cessation and has been demonstrated to reduce the rewarding properties of nicotine [13-15], thereby relieving craving and withdrawal symptoms as well as some of the positive experiences associated with smoking [16,17]. Gibbons, et al. reanalyzed data from the 17 placebo-controlled randomized controlled trials (N=8,027) and found that varenicline significantly increased the abstinence rate, by 124% compared with placebo and 22% compared with bupropion . A recent large multinational randomized, double-blind, triple-dummy, placebo and active-controlled study (The Evaluating Adverse Events in a Global Smoking Cessation Study EAGLES) of 8144 participants also showed Varenicline-treated participants achieved higher abstinence rates than those on placebo (odds ratio [OR] 3.61, 95% CI 3.07 to 4.24), nicotine patch (1.68, 1.46 to 1.93), and bupropion (1.75, 1.52 to 2.01) . Varenicline has been suggested to be more efficacious than other currently available smoking cessation pharmacotherapies such as sustained-release bupropion and the nicotine transdermal patch [13-15,17,19,20]. For the safety of varenicline, a systematic review of varenicline-related neuropsychiatric adverse events identified 25 published cases involving neuropsychiatric adverse effects including depressive symptoms, manic symptoms, insomnia, suicidal idea, agitation, and unstable mood , and ever led the U.S. Food and Drug Administration to issue a black box warning for varenicline-related neuropsychiatric events. Nevertheless, many recent large studies did not show a significant increase in neuropsychiatric adverse events attributable to varenicline relative to nicotine patch or placebo [19,22,23]. Many randomized double-blind placebocontrolled studies have demonstrated the smoking cessation efficacy of varenicline varied across different psychiatric disorders. For patients with schizophrenia or schizoaffective disorder, a 12-week randomized double-blind placebo-controlled study of 84 patients showed the smoking cessation rate of 19.0% in the varenicline group compared with 4.7% in the placebo group . For patients with bipolar disorder, a 12-week randomized double-blind placebo-controlled study of 60 patients revealed that more subjects receiving varenicline (48.4%) quit smoking compared with those receiving placebo (10.3%) . For patients with currently treated or past major depression, the smoking cessation rate was 25.0% in the varenicline group compared with 12.3% in the placebo group in a 12-week randomized double-blind placebo-controlled study . However, those studies were all from non-Asia countries, and few studies compared the efficacy of varenicline among the smokers with different psychiatric disorders. In this 3-month parallel study, we intended to compare the smoking cessation rate and adverse effects with varenicline treatment between the smokers with and without psychiatric disorders, as well as the smokers with different psychiatric disorders. The study was conducted at a medical center in Taiwan by boarded psychiatrists who completed a smoking cessation training program. The smoking cessation program enrolled smokers with and without psychiatric disorders between January 2013 and January 2014. The inclusion criteria for study subjects were (1) cigarette smokers aged more than 20 years, (2) a daily cigarette consumption of more than 10 cigarettes or a Fagerstrom Test for Nicotine Dependence Scale (FTND) score of more than 4; (3) willingness to provide written informed consent, and (4) legally competent to participate. Each patient received interviews and completed questionnaires on the day of recruitment. The data of basic demographic, psychiatric history and the smoking habit was collected. According to the standard treatment guideline, the participants received varenicline at 0.5 mg/day for the first 3 days, 1 mg/day on days 4-7, and 2 mg/day from day 8 to the end of the study. Smokers with psychiatric disorders continued their psychiatric medications which were adjusted according to their individual clinical condition. The subjects were examined at the 6 following time points: at baseline and weeks 2, 4, 6, 8, and 12. At each visit, the subjects received 20 minutes of psychoeducation for smoking cessation, and their daily cigarette consumption and adverse events were recorded. The definition of successful point smoking cessation was the subjects had completely stopped smoking at the survey. This study was conducted in accordance with the Declaration of Helsinki, and the study protocols were approved by the Institutional Review Board of Taipei Veterans General Hospital. All subjects provided informed consent after the study protocol and purpose was explained to them. Statistical analysis was performed using Statistical Package for Social Science version 17 for Windows (SPSS Inc., Chicago, IL). The chisquare test for categorical data and the Student t test for continuous data were analyzed between the smokers with and without psychiatric disorders. We used Fisher exact test if fewer than five data points were expected to be greater than 20% of the cells in the contingency table. The one-way analysis of variance (ANOVA) test was used for continuous data among the smokers with different psychiatric disorders. We used repeated measurement tests to compare the daily cigarette consumption between the smokers with and without psychiatric disorders, and the smokers with different psychiatric disorders. A 2-tailed P value of <0.05 was considered significant. In this study, 140 smokers (104 men and 36 women) were recruited, of whom 94 (67.1%) were diagnosed with at least one psychiatric disorder, namely schizophrenia (n=19), bipolar disorder (n=29), depressive disorder (n=31), and other psychiatric disorders (n=15), including organic brain syndrome (n=3), anxiety disorders (n=4), or insomnia (n=8). Compared with smokers without psychiatric disorders, higher proportions of smokers with psychiatric diseases were women (33.0% vs. 11.0%, p=0.005), younger (43.7 ± 12.8 vs. 49.9 ± 13.8, p=0.01), had a shorter smoking history (22.9 ± 11.7 vs. 27.5 ± 14.1, p=0.046), and had a higher FTND score (7.4 ± 2.1 vs. 6.1 ± 2.2, p=0.001). No significant difference was observed in baseline daily cigarette consumption between the smokers with and without psychiatric disorders (Table 1). Body weight (kg) 73.7± 17.3 70.3± 12.4 N.S. Baseline cigaretteconsumption (cigarettes/day) 27.2± 14.2 25.3± 15.1 N.S. Completion rate 60.7% 65.9% N.S. Reduced cigarette consumption (cigarettes/day) 14.7± 13.7 17.2± 14.5 N.S. Body weight increase (kg) 0.3± 2.9 0.7± 1.0 N.S. Poor attention 3.0% 0% N.S. Increased appetite 5.0% 3.0% N.S. Headache or dizziness 5.0% 13.0% N.S. Gastrointestinal disturbance 8.0% 13.0% N.S. Table 1: Comparison of smokers with and without psychiatric disorders before and after 12-week varenicline treatment. The completion rates for 3 months of varenicline treatment were 60.7% and 65.9% in smokers with and without psychiatric disorders, respectively, without group difference. The definition of successful point smoking cessation was the subjects had completely stopped smoking at the survey. Compared with smokers without psychiatric disorders, those with psychiatric disorders had a significantly lower successful point smoking cessation rate (12.4% vs. 27.3%, p=0.012), higher daily cigarette consumption (13.5 ± 14.2 vs. 8.2 ± 11.0, p=0.032), and lower percentage of daily reduced cigarette consumption (54% vs. 68% p=0.02) (Figure 1 and 2, Table 1). Among the smokers with and without psychiatric disorders, the most commonly reported adverse effects were nausea (12.0% vs. 17.0%) and gastrointestinal discomfort (8% vs. 13%), without any group difference. Neither the patients with or without psychiatric disorders exhibited a significant change in body weight (0.3 ± 2.9 vs. 0.7 ± 1.0 kg) (Table 1). 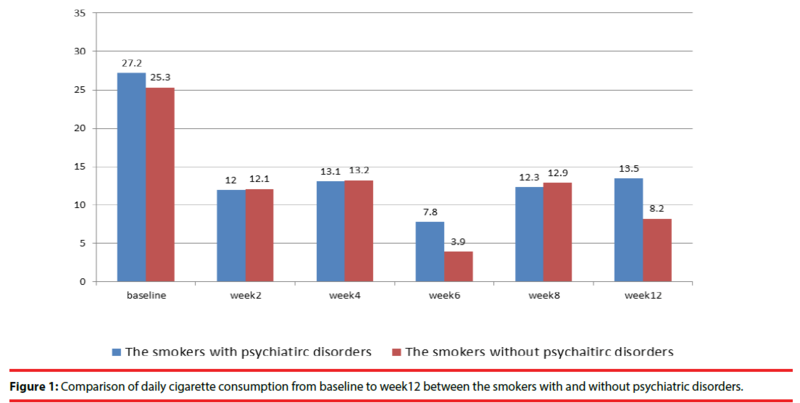 Figure 1: Comparison of daily cigarette consumption from baseline to week12 between the smokers with and without psychiatric disorders. 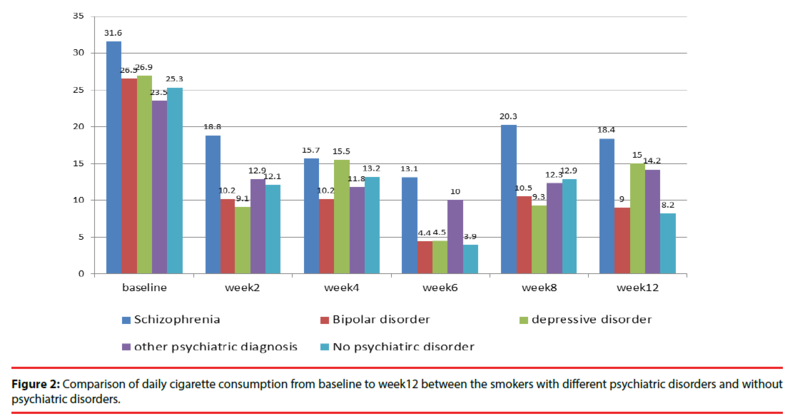 Figure 2: Comparison of daily cigarette consumption from baseline to week12 between the smokers with different psychiatric disorders and without psychiatric disorders. Among smokers with psychiatric disorders, smokers with schizophrenia were significantly younger (p=0.039), had higher FTND scores (p=0.03), and had a higher body weight (p=0.016) than did those with other psychiatric disorders. After 3 months of varenicline treatment, the successful point smoking cessation rates were 11.1%, 13.8%, 17.9%, and 0% for patients with schizophrenia, bipolar disorder, depressive disorder, and other psychiatric disorders, respectively. The percentage of daily reduced cigarette consumption was 50.6%, 64.5%, 52%, and 42.1% for patients with schizophrenia, bipolar disorder, depressive disorder, and other psychiatric disorders, respectively (p=0.021) (Table 2). Females (%) 15.8% 34.5% 45.2% 26.7% N.S. Smoking history (year) 20.8 ± 9.1 22.2 ± 9.8 24.5 ± 12.6 23.7 ± 16.2 N.S. Baseline cigarette consumption (cigarettes/day) 31.6 ± 15.5 26.5 ± 14.3 26.9 ± 14.8 23.5 ± 10.1 N.S. Completion rate 64.7% 75% 51.7% 50% N.S. Successful smoking cessation rate (%) 11.1% 17.9% 13.8% 0% N.S. Cigarette consumption (cigarettes/day) 18.4 ± 17.8 9.0 ± 10.0 15.0 ± 18.3 14.4± 5.6 N.S. Reduced cigarette consumption (cigarettes/day) 16.0 ± 14.0 17.1 ± 15.1 14.0 ± 13.1 9.9 ± 12.1 N.S. Body weight increase (kg) 0.3 ± 2.3 0.7 ± 2.5 -0.4 ± 4.1 0.5 ± 1.3 N.S. Anxiety 0 3.8% 8.3% 0 N.S. Restless 0 0 8.3% 8.3% N.S. Poor attention 0 0 8.3% 0 N.S. Palpitation 0 0 0 0 N.S. Increased appetite 0 15.4% 0 0 N.S. Insomnia 6.7% 0 20.8% 8.3% N.S. Headache or dizziness 0 0 8.3% 16.7% N.S. Fatigue 0 0 0 0 N.S. Nausea 6.7% 19.2% 8.3% 8.3% N.S. Gastrointestinal discomfort 6.7% 3.8% 16.7% 0 N.S. Other diagnoses including organic brain syndrome (n=3), anxiety disorders (n=4), and insomnia (n=8). N.S. : non-significant. Table 2: Comparison of characteristics of smokers with different psychiatric disorders before and after 12-week varenicline treatment. To our knowledge, this is the first Asia study to compare the efficacy of varenicline for smoking cessation among the smokers with and without psychiatric disorders. Our results showed that the smokers with psychiatric disorders had a significantly lower point smoking cessation rate (12.4% vs. 27.3%, p=0.012), and a lower percentage of daily reduced cigarette consumption (54% vs. 68%, p=0.02) than did the smokers without psychiatric disorders. Our result was different from the recent large EAGLES study with psychiatric cohort (n=4116) and non-psychiatric cohort (n=4028) . Although they found the abstinence rates are lower in the psychiatric cohort versus non-psychiatric cohort (29.2% vs 38.0% at week 9-12), but no statistical difference was noted in the two groups. Our observation of 27.2% smoking cessation rate in the smokers without psychiatric disorder is within the ranges of 22%–44% from previous reports in the general population [13-15,17-20]. But the smoking cessation rate of the smokers with psychiatric disorders (11.1%, 17.9% and 13.8% for patients with schizophrenia, bipolar disorder, and depressive disorder, respectively) were lower than that in previous reports (19.0%, 48.4%, 25.0%, and 29.2% in smokers with schizophrenia or schizoaffective disorder , bipolar disorder , depression , and psychiatric cohort in EAGLES study , respectively). However, all previous studies were from non-Asia patients. Our study is the first Asia report. Further studies with larger samples are required to investigate the ethnic or culture differences, which may influence the efficacy of varenicline between the smokers with and without psychiatric disorders. In our study, the smokers with psychiatric disorders were significantly younger, more females, with a shorter smoking history and a higher FTND score than the smokers without psychiatric disorders. The results indicated these patients developed higher smoking dependence in short period. Nevertheless, the characteristic differences were not noted in the EAGLES study . The higher prevalence of cigarette smoking of 2-3 times in patients with psychiatric disorders than those in the general population and biopsychosocial mechanisms that underlie the high smoking rates [1,4-10] has offered at least a partial support of our study. The greater difficulty of smoking cessation has been documented in a nationally representative survey of noninstitutionalized in the US. While remarkable progress has also been made in reducing the prevalence of tobacco use in the general population from 2004 to 2011, the decline in smoking among individuals with mental illness has become much less . The authors concluded that tobacco control policies and cessation interventions targeting the general population have not worked as effectively for persons with mental illness . Our result suggested the development of novel tobacco treatments integrated with psychiatric management for these patients is required. However, from another point of view, our results showed that the percentages of daily reduced cigarette consumption after 3-months of varenicline treatment were significant: 54% overall for patients with psychiatric disorders, and 50.6%, 64.5%, and 52% for patients with schizophrenia, bipolar disorder, and depressive disorder, respectively. Previous studies have shown other positive effects of varenicline treatment in the smokers with psychiatric disorders [28,29]. An 8-week randomized double-blind placebo-controlled trial of 120 patients with schizophrenia has shown the beneficial effects of varenicline treatment for some cognitive impairment . Another doubleblind randomized placebo-controlled trial of patients with schizophrenia or schizoaffective disorder showed that varenicline can improve executive function . Increasing evidence suggest that smoking reduction can substantially improve mental well-being and physical health and that it does not exacerbate pre-existing mental illness [30,31]. This is particularly true if the tobacco cessation intervention is integrated into the context of ongoing mental health treatment . In addition, a study followed the patients with schizophrenia 2 years after they had completed a 12-week trial of bupropion added to cognitive-behavioral therapy. They found that more subjects were abstinent at the 2-year follow-up than at the 12th-week end of the trial. They suggested that the behavior changes achieved through smoking cessation programs for patients with schizophrenia can persist and predict future smoking behavior. These results suggested the integrated pharmacotherapy and cognitive-behavioral therapy would be important for the smokers with psychiatric disorders. Among the smokers with psychiatric disorders, previous studies showed a higher proportion of patients with schizophrenia (70%–90%) are smokers, compared with the proportion of patients with bipolar disorder (54%) and depressive disorder (40%–50%) [4-6]. Furthermore, previous studies also showed the patients with schizophrenia tended to have a lower smoking cessation rate than do the patients with bipolar disorder and depressive disorder (19%, 48.4%, and 25%, respectively) [24-26], although it was not compared directly in previous studies. In our study, the smokers with schizophrenia were with significantly younger and higher FTND scores than the smokers with other psychiatric disorders, also tended to have lower smoking cessation rate than the patients with bipolar disorder and depressive disorder (11.1%, 17.9%, and 13.8%, respectively), although without statistical significance with the small study sample. Previous studies have shown nicotine may improve the cognitive performance of people with schizophrenia by enhancing the activation of a network of regions , and increase dopaminergic transmission in the central nervous system and improve sensory gating deficits observed in patients with schizophrenia . In addition, smoking may reduce the blood level of antipsychotic drugs through increasing hepatic metabolism, and diminish the side effects of antipsychotics . From a biological perspective, the patients with schizophrenia are at higher risk to have to smoke and encounter more difficulty quitting smoking. Our result also showed the smokers with schizophrenia had a significantly higher body weight, which may be related to the long-term use of antipsychotics [9,34], and the increased risk of cardiovascular risk [2,3] needs more attention. There are some limitations in this study. First, our study had a small sample size and no placebo arm. The psychological support and reminding effect in the smoking cessation program may contribute to the outcomes. Second, cigarette smoking consumption was reported subjectively, and no objective measurements, such as a carbon monoxide detector, were conducted. However, our study is the first Asia study to compare the efficacy of smoking cessation of varenicline between smokers with and without psychiatric disorders, and showed the different results from the non-Asia subjects. Although our results showed the smokers with psychiatric disorders had lower point smoking cessation rate than those without psychiatric disorders, varenicline could reduce the daily cigarette consumption substantially in this 12-week study. Regarding their high prevalence of cigarette smoking, the development of novel tobacco treatment program integrated with psychiatric management for these patients is required. The study was supported by grants from Taiwan Ministry of Science and Technology (MOST 104- 2314-B-075-017), and Taipei Veterans General Hospital (V103E9-005, V103E3-006). Tidey JW, Miller ME: Smoking cessation and reduction in people with chronic mental illness. BMJ 351(1), h4065 (2015). Brown S, Inskip H, Barraclough B. Causes of the excess mortality of schizophrenia. The Br. J. Psychiatry 177(1), 212-217 (2000). Himelhoch S, Lehman A, Kreyenbuhl J, et al. Prevalence of chronic obstructive pulmonary disease among those with serious mental illness. Am. J. Psychiatry 161(12), 2317-2319 (2004). Olivier D, Lubman DI, Fraser R. Tobacco smoking within psychiatric inpatient settings: biopsychosocial perspective. Aust. N Z J. Psychiatry 41(7), 572-580 (2007). Ziedonis DM, George TP. Schizophrenia and nicotine use: report of a pilot smoking cessation program and review of neurobiological and clinical issues. Schizophr. Bull 23(2), 247-254 (1997). Kreinin A, Novitski D, Rabinowitz D, et al. Association between tobacco smoking and bipolar affective disorder: clinical, epidemiological, cross-sectional, retrospective study in outpatients. Compr. Psychiatry 53(3), 269-274 (2012). Uneri O, Tural U, Cakin Memik N. Smoking and schizophrenia: where is the biological connection? Turk. Psikiyatri. Derg 17(1), 55-64 (2006). Callaghan RC, Veldhuizen S, Jeysingh T, et al. Patterns of tobacco-related mortality among individuals diagnosed with schizophrenia, bipolar disorder, or depression. J. Psychiatr. Res 48(1), 102-110 (2014). Newcomer JW, Hennekens CH. Severe mental illness and risk of cardiovascular disease. JAMA 298(15), 1794-1796 (2007). Minichino A, Bersani FS, Calo WK, et al. Smoking behaviour and mental health disorders-mutual influences and implications for therapy. Int. J. Environ. Res. Public. Health 10(10), 4790-4811 (2013). Baiardini I, Sorino C, Di Marco F, et al. Smoking cessation, anxiety, mood and quality of life: reassuring evidences. Minerva Med 105(5 Suppl 1), 15-21 (2014). Ragg M, Gordon R, Ahmed T, et al. The impact of smoking cessation on schizophrenia and major depression. Australas. Psychiatry 21(3), 238-245 (2013). Fedota JR, Sutherland MT, Jo Salmeron B, et al. Reward Anticipation is Differentially Modulated by Varenicline and Nicotine in Smokers. Neuropsychopharmacology 40(8), 2038-2046 (2015). Jorenby DE, Hays JT, Rigotti NA, et al. Efficacy of varenicline, an alpha4beta2 nicotinic acetylcholine receptor partial agonist, vs placebo or sustained-release bupropion for smoking cessation: a randomized controlled trial. JAMA 296(1), 56-63 (2006). Ebbert JO, Hughes JR, West RJ, et al. Effect of varenicline on smoking cessation through smoking reduction: a randomized clinical trial. JAMA 313(7), 687-694 (2015). Ravva P, Gastonguay MR, Faessel HM, et al. Pharmacokinetic-pharmacodynamic modeling of the effect of varenicline on nicotine craving in adult smokers. Nicotine. Tob. Res 17(1), 106-113 (2015). Fagerstrom K, Hughes J. Varenicline in the treatment of tobacco dependence. Neuropsychiatr. Dis. Treat 4(2), 353-363 (2008). Gibbons RD, Mann JJ. Varenicline, smoking cessation, and neuropsychiatric adverse events. Am. J. Psychiatry 170(12), 1460-1467 (2013). Anthenelli RM, Benowitz NL, West R, et al. Neuropsychiatric safety and efficacy of varenicline, bupropion, and nicotine patch in smokers with and without psychiatric disorders (EAGLES): a double-blind, randomised, placebo-controlled clinical trial. Lancet 387(10037), 2507-2520 (2016). Garrison GD, Dugan SE. Varenicline: a first-line treatment option for smoking cessation. Clin. Ther 31(3), 463-491 (2009). Ahmed AI, Ali AN, Kramers C, et al. Neuropsychiatric adverse events of varenicline: a systematic review of published reports. J. Clin. Psychopharmacol 33(1), 55-62 (2013). Burke MV, Hays JT, Ebbert JO. Varenicline for smoking cessation: a narrative review of efficacy, adverse effects, use in at-risk populations, and adherence. Patient. Prefer. Adherence 10(1), 435-441 (2016). Wu Q, Gilbody S, Peckham E, et al. Varenicline for smoking cessation and reduction in people with severe mental illnesses: systematic review and meta-analysis. Addiction 111(9), 1554-1567 (2016). Williams JM, Anthenelli RM, Morris CD, et al. A randomized, double-blind, placebo-controlled study evaluating the safety and efficacy of varenicline for smoking cessation in patients with schizophrenia or schizoaffective disorder. J. Clin. Psychiatry 73(5), 654-660 (2012). Chengappa KN, Perkins KA, Brar JS, et al. Varenicline for smoking cessation in bipolar disorder: a randomized, double-blind, placebo-controlled study. J. Clin. Psychiatry 75(7), 765-772 (2014). Anthenelli RM, Morris C, Ramey TS, et al. Effects of varenicline on smoking cessation in adults with stably treated current or past major depression: a randomized trial. Ann. Intern. Med 159(6), 390-400 (2013). Cook BL, Wayne GF, Kafali EN, et al. Trends in smoking among adults with mental illness and association between mental health treatment and smoking cessation. JAMA 311(2), 172-182 (2014). Shim JC, Jung DU, Jung SS, et al. Adjunctive varenicline treatment with antipsychotic medications for cognitive impairments in people with schizophrenia: a randomized double-blind placebo-controlled trial. Neuropsychopharmacology 37(3), 660-668 (2012). Hong LE, Thaker GK, McMahon RP, et al. Effects of moderate-dose treatment with varenicline on neurobiological and cognitive biomarkers in smokers and nonsmokers with schizophrenia or schizoaffective disorder. Arch. Gen. Psychiatry 68(12), 1195-1206 (2011). Mendelsohn CP, Kirby DP, Castle DJ. Smoking and mental illness. An update for psychiatrists. Australas. Psychiatry 23(1), 37-43 (2015). Prochaska JJ, Hall SE, Delucchi K, et al. Efficacy of initiating tobacco dependence treatment in inpatient psychiatry: a randomized controlled trial. Am. J. Public. Health 104(8), 1557-1565 (2014). Evins AE, Cather C, Rigotti NA, et al. Two-year follow-up of a smoking cessation trial in patients with schizophrenia: increased rates of smoking cessation and reduction. J. Clin. Psychiatry 65(3), 307-311 (2004). Jacobsen LK, D'Souza DC, Mencl WE, et al. Nicotine effects on brain function and functional connectivity in schizophrenia. Biol. Psychiatry 55(8), 850-858 (2004). Bai YM, Chen TT, Yang WS, et al. Association of adiponectin and metabolic syndrome among patients taking atypical antipsychotics for schizophrenia: a cohort study. Schizophr. Res 111(1-3), 1-8 (2009).